Director/Teleplay – Rodney Gibbons, Producer – Irene Litinsky, Photography – Serge Ladocoeur, Music – Marc Oullette, Visual Effects – Big Bang FX Animation Inc. (Supervisor – Balin Hewitt), Special Effects – Intrigue Productions (Supervisor – Pierre Rivard), Production Design – Jean-Baptiste Tard. Production Company – Hallmark Entertainment/Muse Entertainment. Sherlock Holmes is brought in by Brother Marstoke to investigate a murder at St Justinian’s monastery in Whitechapel. Brother Marstoke fervently believes in the existence of Desmodo, a native vampire demon that was seen killing several other members of the order at the mission in Guyana, and is responsible for the murder. Holmes is equally certain that corporeal forces are at play. As Holmes investigates a reclusive bat expert and sinister goings-on at the monastery, the bat figure emerges to kill further victims using seemingly supernatural abilities. The Case of the Whitechapel Vampire was the last of four Sherlock Holmes tv movies made by the Canadian-based production company Muse Entertainment, all of which aired on the Hallmark tv channel. The Case of the Whitechapel Vampire was preceded by The Hound of the Baskervilles (2000), The Sign of Four (2001) and The Royal Scandal (2001). All four Sherlock Holmes tv movies were directed by former cinematographer Rodney Gibbons and starred Matt Frewer as Sherlock Holmes and Kenneth Welsh as Dr Watson. All the other Muse Sherlock Holmes films had been adapted from Arthur Conan Doyle’s original Sherlock Holmes stories (albeit quite liberally). I initially thought that The Case of the Whitechapel Vampire might have been an adaptation of Conan Doyle’s The Adventure of the Sussex Vampire (1924) but this turns out not to be the case and The Case of the Whitechapel Vampire is an original script. (The film even notes on the opening credits that Arthur Conan Doyle’s works are now in public domain). I will also admit that I hate Muse’s Sherlock Holmes tv movies. They are cheaply made – the sets for Victorian London look just like they are sets. One also gets the impression that nobody involved in the production of The Case of the Whitechapel Vampire has ever been to England or knows anything about its history – the film, for one, locates a major Catholic monastery in an overwhelmingly anti-Catholic country – indeed, Henry VIII passed an act specifically known as The Dissolution of the Monasteries in the 16th Century. Not to mention the fact the London’s Whitechapel district (the site of the Jack the Ripper murders) was an area that existed in a state of overwhelming destitution and poverty during the Victorian era. The worst aspect of Muse’s Sherlock Holmes films is the casting of Matt Frewer. 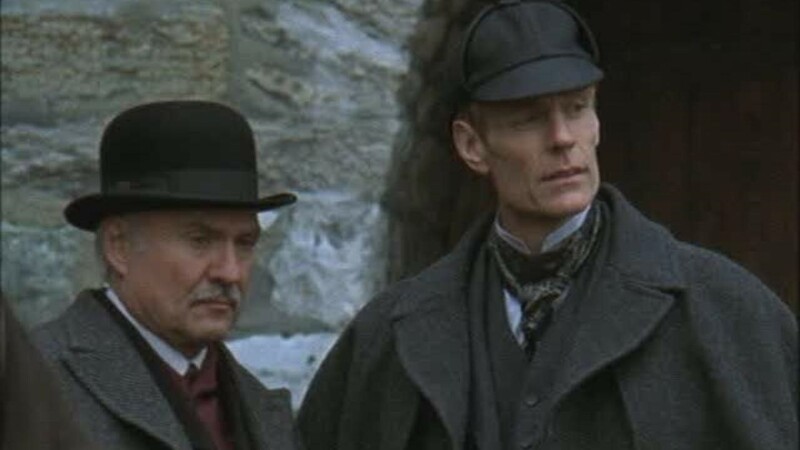 Matt Frewer must have to be the single worst portrayal of Sherlock Holmes in the entire history of Holmes on film. Frewer camps the part up in the way that he usually does, vying between a fruity falsetto and a fake baritone, sometimes within the space of the same sentence. It is a ludicrous performance – where Sherlock Holmes’s intellect exists solely as an actor’s posturing. Even aside from Matt Frewer dragging it down, The Case of the Whitechapel Vampire is dreary as a Sherlock Holmes mystery. It is prosaic in the writing and lacks any suspense in the unfolding of the mystery. Even worse, for the virtuoso grasps of deduction that Sherlock Holmes has come to stand for, the end revelation is full of logic holes – if the vampire is merely a mortal seeking revenge, then why does he kill other people unrelated to the matter? Or why for that matter does he need to pose in an elaborate vampire creature costume when much simpler methods of murder would easily have sufficed? The ending of the film, like The Adventure of the Sussex Vampire, is mundane in its explanation of the vampire. Despite this, the screenwriter has seen fit to throw in various references to Bram Stoker’s Dracula (1897), including a Renfield Place and a Demeter Street.